One of the most popular staples of emo fashion is emo hoodies. Many emos wear emo hoodies all year long, whether it be winter or summer. It’s the item of clothing on your body that most people will notice first, and thusly it’s pretty important to your overall fashion statement. There are many different kinds of emo hoodies, and I’ll go over a few below. Some emos opt to wear plain colored hoodies, but it’s much more common to see the types of emo hoodies listed below. Stripes have played a pretty big part in emo fashion, especially for guys. 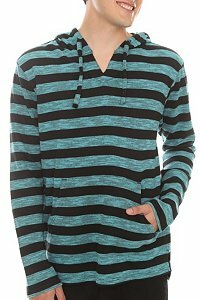 Dark colored stripped emo hoodies emerged as a popular style in the emo fashion circle shortly after emos started making a transition from pure black clothing to a more diverse fashion sense. Some popular strip color combinations are black and gray and black and purple. Emo shirts are a big part of the emo image, especially for guys. There are basically 3 different types of emo shirts: a plain black t-shirt or tank top, a band shirt, or a graphic or novelty t-shirt. Of course, thanks to the expansion of the style, there is a much broader range of shirts that can be considered emo shirts, but for the sake of brevity this article is going to focus on those three types of emo shirts. The classic black t-shirt was a staple in the original introduction of emo culture into society. It’s still fairly popular today as they are inexpensive to buy and can be worn plain or accessorized. Popular ways to spice up a black t-shirt are to throw a flannel on over it, or accessorize with a bandana. Next in the line up of emo shirts is band t-shirts. This is a staple for most emo guys. Band shirts are a great way to tell the world who you listen to and allow them to associate your style, not only with the way that you dress, but with the type of music that you listen to. Older rock band t-shirts are also popular as well as shirts of current bands. Typically, female emos swing more towards wearing novelty or graphic t-shirts as opposed to band shirts. These emo shirts will usually have a popular character, such as Zim from Invader Zim, or a catchy phrase with a cute character. Cupcakes and dinosaurs are pretty popular right now. A lot of emo girls simply wear plain tank tops and accessorize the living hell out of them. The truth is that you can make almost any shirt fit in with your emo style if you know how to accessorize it correctly. The emo shirts pictured in this article are available from Hot Topic. Yes, another article on how to do emo makeup. Lol Except for in this article we’re going to cover doing the entire face instead of just the eyes. The essence of the emo looks is relatively nature. In most cases, the most distinguishing factor is the eyes. You can achieve the natural look by only concentrating your makeup efforts on your eyes, or you can still get a comparatively natural look by doing the whole shebang. If your skin is fairly smooth and acne free, you’ll probably want to leave out using foundation completely. Otherwise, you should start with a skin tone concealer on the more blotchy spots of your face. When you have finished applying concealer then it’s time for the foundation. There are two options for achieving the perfect emo look. Either go skin tone, which will give you a more overall natural look, or choose a shade or two lighter to give yourself a more pale complexion, which can give your eyes a nice pop with the right eye makeup. How to apply concealer: Apply several small drops of concealer onto the spots on your face that you wish to conceal, then use the pad of your index for middle finger to tap it in. It is imperative that the color of your concealer match your skin tone. You can also apply concealer to the underneath of your eyes to help get rid of dark circles. How to apply liquid foundation: If you are going to use liquid foundation then you need to apply it before the concealer, otherwise when you go to apply it over the concealer, sponge will wipe the concealer away and you’ll need to reapply it after you’re done applying your foundation. To start apply foundation, you will need a sponge. First dip the sponge in water. It needs to be damn, not completely saturated. Why do we do this? Well, if the sponge is dry then it will soak up the foundation and waste some of it. If the sponge is damp then the foundation will sit on top of it and glide onto your face easily. Put a small amount of liquid foundation onto your sponge. Remember that, oftentimes, less is more. Now start in the center of your face and apply the foundation, working from the center of your face towards the sides rather than up and down. Make sure that the foundation spreads easily. If you have picked a foundation that matches you skin tone, and you don’t want to apply a whole bunch of makeup, then you can use the foundation only in places that you need it as long as it flawlessly blends in with the rest of your skin. If you have picked a lighter shade of foundation then you will obviously want to use it on your entire face. If you find that foundation gathers in certain areas, such as your hairline, around your mouth, or your eyebrows, simply smooth it away with the sponge. Set the foundation with loose powder, following application. How to apply powder foundation: Dip your brush or compact pad into the foundation. Apply the foundation to the center of your face, cheeks, forehead, and chin and blend it outwards towards the sides of your face. Blend until the foundation appears to vanish and become your natural skin tone. Pay special attention to blending around areas on your face that crease, as this is where makeup tends to build up and become most visible. Once you have finished applying the foundation, set it with loose powder. Most emos don’t use blush at all, but if you are going to use it, it should be used sparingly. When purchasing blush, choose a light shade that matches the color of your cheeks after you have finished exercising. This is your natural blushing color. If you have dry skin, you may want to use a cream blush as it will help to keep your face hydrated. If you have oily skin, then you’re skin is better suited for a type of powder blush. You will want to have finished applying your concealer, foundation, and eye makeup before you begin applying blush. How to apply blush: If you are using powder blush then you will start by placing a small amount of blush on your brush and then tapping it gently to knock off any excess blush so that you don’t apply too much. If you are using cream blush them apply a small amount to your middle finger. Next, look in the mirror and smile. If you are using powder blush, you will want to place the brush on the apple of your cheek and gently brush up from your cheekbone towards your hairline. If you are using cream blush then dot it at the beginning of the apple of your cheek and gently blend it up the cheekbone toward the hairline. How to apply eye shadow: Start by dusting your eyelids with a small amount of loose powder. This will keep the eye shadow from causing that horrid eye makeup clumping that tends to happen at the crease of the eye lid. It will also help your eye shadow to stay on all day long instead of swearing it off. If you plan on using a lighter base color, then start by using a shadow brush to apply your base color from brow to lash line, sweeping across your entire eyelid. For your main color, apply to the entire eye lid, stopping at the crease. Blend the two tones of eye shadows together by stroking your eye lid gently at the blending point with an eye shadow brush. Do not use your finger as you could wipe off the eye shadow entirely and/or create a big mess. All emos who do not go for the completely natural look wear fairly dramatic eye makeup. Using pencil eye liner will not give your eyes as much of a stand out dramatic affect as liquid eye liners do. For that reason, in this tutorial I’m only going to teach how to apply liquid eye liner. Most emos wear black eye liner only, but you can experiment with different colors as you like. Use eye liner after you’ve applied your eye shadow and before you’ve applied your mascara. How to apply eye liner: Rest the elbow of the hand that you’re going to use to apply your eyeliner on a hard surface and rest the wrist of that hand against your face. Tilt your head back slowly and open your eyes halfway. This allows you to see what you’re doing while also giving you a good angle for application. Draw a line across the upper lid of the last line, as close to the lashes as possible while still remaining on the lid. This will help create the illusion of longer lashes. For a more dramatic affect, you can make this line thicker. Once you have done this, wait for a couple of seconds to allow the liquid liner to dry before you completely open your eyes, otherwise it will transfer onto your eyelids when you open your eyes and create a mess. Follow the same steps for your lower eye lid. If you mess up, you can remove the eye liner by tipping the tip of a cotton swab into some eye make up remover and rubbing it over the eye liner. Needless to say, be careful not to get it in your eyes. A lot of emo girls who like the more dramatic effect will opt to apply fake eye lashes. This can look very cute on the right girl and is a popular practice of the emo culture. For those of us who don’t have the patience to do that, here’s a mascara tutorial. There are tons of different types of mascara to choose from. For the purpose of emo makeup, it’s recommended that you choose a brand that is designed for lengthening. Most emos wear black mascara. Applying mascara is the last step in the eye makeup process. How to apply mascara: Start by curling your eyelashes. Remove the wand from the mascara tube in one pull. Do not pump it in and out. This pushes air into the tube which dries out your mascara. Holding the wand parallel to your eyelid, apply the mascara starting with the underside of your upper lashes, moving the brush slowly upward from the base of your lashes to their tips. To separate your eye lashes and keep them from clumping together, roll the brush slowly on the upward stroke. This is a step that so many people miss and is the main cause of ugly clumping eye lashes. Allow the first coat of mascara to dry and then apply a second coat using the same steps mentioned above. If your eye lashes do happen to clump together, you can separate them before they dry with an eye lash comb. If you applied too much mascara, you can blot your eye lashes with tissue paper to remove the excess. For the lower lashes, repeat the above steps, stroking downward from the base of the eyelash to the tip. Only apply one coat of mascara as opposed to the two coats that you use on the upper eye lashes. To remove any mascara that may have accidentally gotten onto your face, use a cotton swab with a small amount of eye makeup remover to blot the stray mascara away. Most emos I know don’t wear lip stick. Those that do choose to go with a natural tone. Many, however, do wear lip gloss. It makes the lips shine all pretty like, keeps them hydrated, and usually either smells and/or tastes fruity. Yum! How to apply lip gloss: The process of applying lip gloss is fairly simple and straight forward. For liquid lip gloss, take the applicator stick and rub the gloss on your lips, evenly distributing it. For roll-on lip gloss, roll the roller across your lips, starting with your bottom lip and then the top lip. For tube lip gloss, put a small amount on your finger and rub it on your lips, evenly distributing it. Try not to apply the lip gloss too thick as this can cause it to cake at the sides of your mouth and look gross. Also, you don’t want to be eating it. If you accidentally apply outside of your lip line, wipe the excess lip gloss off with a tissue, as wet lip gross on skin is also very unattractive. Do not blot the lip gloss once it is applied. This will cause it to lose it’s shine and thusly defeat the purpose of applying it in the first place. If you want, you can apply lip gloss after you apply your lip stick. I think this is more of a book than an article. Lol Anyway, there you have it folks, how to apply emo makeup. Add your own makeup tips in the comments section. Transitioning between styles can be a difficult period in your life, especially if you hang out with a group of people from a certain culture whose style you’re transitioning away from. Many times, changes are gradual. In fact, if you want to learn how to become emo and still keep the same friends that you have right now, then it would be best to make the change gradual so that you don’t send your friends into shock or have people calling you a poser. So, if you really want to know how to become emo then you need start at the core of what emo really is, which is a style of music. The truth of the matter is that you can look emo, but if you listen to, we’ll say primarily country music for the sake of argument, then you’re just going to come off as a poser. If you like the emo style but don’t enjoy the music, then the truth is that you’ll never truly be emo as the way that society sees it. If you like the music and are ready to make a change of fashion, then slow and steady will win the race. And by slow, I don’t mean taking an entire year to transition your style, but if you don’t want to come off as an uber poser then you should probably take about a month or two to gradually change things. This will not only help your friends ease into the idea of you being emo, but will also make things feel less awkward for you than having a sudden overnight switch. Obviously, if you have a lot of emo friends then this transition period may occur faster and be a lot less awkward for all parties involved. Here’s a slow transition guidelines that you can follow to achieve the style you want while not throwing your friends into shock or seeming like a poser who switched styles overnight. Week 1: Start wearing emo band shirts or shirts that are symbolic to the emo culture. Week 2: Trade out the shoes that you normally wear for Converse, Vans, or ballerina flats (if you’re a girl). Week 3: Switch over to wearing skinny jeans. Week 4: Accessorize. Go buy some studded belts or jewelry to accessorize your outfit. Week 5: Get a new haircut. Week 6: Change up your makeup (if you’re a girl). You may be tempted to change your style overnight, but that’s not how to become emo if you plan on attracting other emos and don’t currently have any emo friends. Drastic overnight changes of style are very characteristic of posers and have a 99% fail rate for your reputation in assimilating with people of the new culture that you wish to become a part of. Notice that I didn’t mention picking up any negative stereotypes in how to become emo. There is no need for you to act any different than you already act. After all, being who you really are will always get you farther ahead than being fake. If anyone else has any tips on how to become emo, please feel free to leave them below so that other people who are interested in making the change might have an easier transition period. So you’ve decided to write a novel and incorporate one or more emo characters into your book. But what if you know nothing about emos? This article is designed to show you how to design a character. Emos have changed greatly from the time since the culture was first introduced to society. In fact, by the time you read this article, the style may have changed even further, so your best bet in creating the most awesome emo characters that you possible can is to check out some currently updated emo websites to see what the current trends of the style are. There are generally two different types of emo characters, the traditionally dark dressed angsty teen and the more modern colorfully dressed up beat teen. The more traditional emo will be highly moody with possible frequent outbursts of sobbing. He or she will wear mainly black clothing and have a defining side swooping bang. The modern emo will dress in a variety of colors and be far more outgoing and less moody. The best way to get an idea of how your emo characters should be described is to Google Image the words ‘emo styles’, and create a character out of the mix of images that are pulled up. A great way to get a feel for how your emo characters should act is to check out a popular emo forum. There’s no better way to design a character than to know what that type of character would generally act like. As with any forum, you will encounter a wide array of personalities. Simply find someone who you think is interesting, and model your character after their personality. To read Sunset High, a novella series involved emo characters, Go Here.